Plot 1, Kenny Close comprises a new detached 3 bedroomed bungalow with single garage, at present under construction and offered with a choice of kitchen units from the builders range. The bungalow is situated on a private drive and cul-de-sac development of just three new bungalows constructed by Lowe Construct & Build Ltd and offered of course with a building warranty. The site is situated off Gilbert Way and Kenny Close is In a quiet and secluded area of Fernwood adjacent to mature woodland. Features include air sourced under floor heating throughout providing exceptionally low running costs. The bungalow is within a couple of minutes walk to shops, amenities and bus services from Fernwood to Newark. The accommodation provides an entrance hall with large built-in cupboard, living room with French doors, spacious dining kitchen with French doors to the garden, 3 bedrooms, master en suite and family bathroom. There is an enclosed south facing garden area and a single garage. The village of Fernwood is conveniently situated just over 2 miles from Newark. This local community has its own parish council, village hall, primary school, a convenience shop, gymnasium, day nursery and veterinary surgery. A central point of the village is the parkland adjacent to Kenny Close. The bungalows here are within a short walking distance of these local amenities and regular bus services to Balderton and Newark. The village is conveniently situated for access points to the A1 and A46 trunk roads. Newark has two railway stations, with train services from Castlegate to Lincoln and Nottingham, and services from Northgate to London Kings Cross with journey times of just over 75 minutes. Note - Measurements are taken from plan at this stage of construction and the builder will reserve the right to make alterations. Entrance Hall - With large walk-in cupboard. Living Room - 4.83m x 4.11m (15'10" x 13'6") - With French doors. 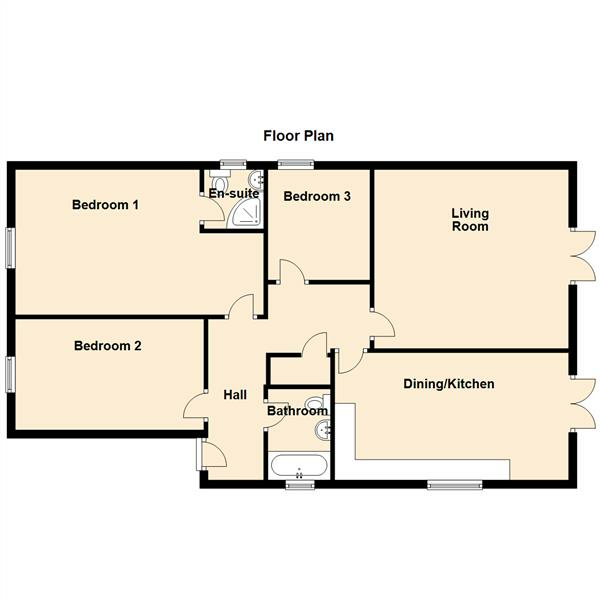 Dining Kitchen - 6.05m x 3.28m (19'10" x 10'9") - Fittings and appliances to purchasers choice from the builders range. A spacious dining kitchen with ample space for a table and French doors leading to the garden. Bedroom One - 6.22m x 3.05m (20'5" x 10') - Including en suite. En Suite - With shower, basin and low suite WC. Bedroom Two - 4.75m x 2.54m (15'7" x 8'4") - A good double sized bedroom. Bedroom Three - 2.74m x 2.54m (9' x 8'4") - A single sized bedroom. Bathroom - 2.29m x 1.80m (7'6" x 5'11") - With bath, basin and low suite WC. Garage - 5.6 x 2.903 (18'4" x 9'6") - With personal door. Outside - There is a forecourt frontage and a south facing enclosed rear garden. Services - Mains water, electricity and drainage will be connected to the property. Directions - From the A1 take the Fernwood turn off onto the B6326 going straight ahead on the first roundabout still on the B6326. At the 2nd roundabout take the 1st left onto Dale Way. Continue until passing Thomas Road on the right, then make a left onto Gilbert Way to find Kenny Close ahead.